Once used for either functional or ceremonial purposes, today’s Native American Indian baskets have become a highly prized art form. 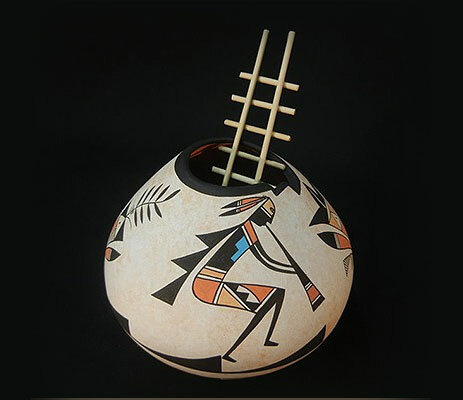 Modern basket weavers use the same traditional methods and techniques as their ancestors. Hopi baskets often display pictorials or colorful images of kachina masks. Many of these were made for and given away during special ceremonies and feasts, including their marriage celebrations. Wedding baskets are the most common of all Indian baskets, identified by their symbolic design of alternating red and black patterned layers. The inner black steps are believed to represent the underworld, the red steps earth and life, and the outer black layer represents the upper world. Bundles of fiber are gathered and wrapped with further fiber to create a coil. The finished coil is then coiled with others to create a larger piece. With plating, strips of fiber are woven over and under one another at right angles. The resulting pattern looks much like a checkerboard. Twining requires that strips of fiber are “twined” diagonally. Twining in this way creates a very strong foundation, and thus a stronger basket. The wicker technique uses twig-like pieces as a foundation to create a strong basket. Yucca shoots, vines, and twigs are most often used. The method a basket weaver uses is determined by the desired design. If you’re looking to purchase one of these superb examples of Indian basket weaving, Palms Trading Company is where you’ll find it. Our online selection of Native American Indian jewelry, pottery and folk art is only a sample of our total inventory. To view more of our selection, contact us to use our personal shopper service.